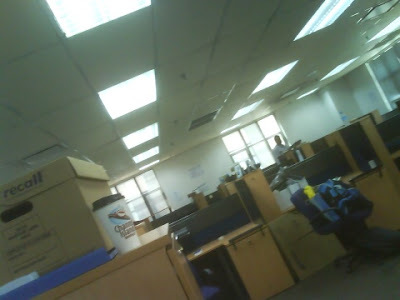 I have not moved office before, not in this scale at least. I feel the excitement, the tension, a lot of expectation in most of us. I also can see the various different ways people reacted and behaved. While some only packed today, I packed as early as 3 weeks ago and settled back into my work. I suppose I like to be ready. I planned what I had needed and have them packed in my everyday bag and those that can wait I got them into the boxes. Talking about "the last day", it obviously reminded me about The Last Day that Jesus talked about. I am now wondering why is it being called "the last" and why is it a singular "day"? If you think about it, this is my last day here in the "old" office and I will be there on the first day on Monday, in the new office. Is The Last Day our last day here on this earth before we go to the new heaven and new earth? Doing a search in BibleWorks, te eschate hemera, the last day, is only found in the Gospel of John (6:39, 40, 44, 54, 11:24, 12:48). It refers to raising up and resurrection of the dead. I checked my Pillar, NICNT and WBC commentaries, the ATLA Serials, nothing much is available on the mention of "the last day". But I am sure it has ties to "the last days", "the day of the Lord", "that day", eschatology - which I need to dig into soon. Yeah, sounds like a good idea - call me anytime you are free then - why is it I get this feeling this will never happen? haha ... Kar Yong free? Alamak, Evangel sale I can tahan but Canaanland a bit more difficult. IF Sufes sales, die lor. Don't worry lah...Sufes where got sale one?